After the success of Micromax in India market, the device with Quad core processor is flowing in the market and Acer has joined this race with the launch of its recent quad-core powered device Acer Liquid E2. launching its third Smartphone, since the beginning of the year, Acer has launched Liquid E2 ,the successor of Acer Liquid E1 and Z2 and it is the latest addition to the series further strengthening the company commitment to the smartphone market. The device Liquid E2 is the Acer’s first quad-core phone with optional dual SIM card slot targeted at multimedia user and if the device come to the Indian market it will be a new rival to the Micromax A116 Canvas HD’s along with Zen Ultraphone 701 HD and spice’s recent launch Stellar Pinnacle Pro Mi-535 but the chance of the device coming to the Indian market is very less. The device will sport the 4.5-inch display with 960x540p resolution which looks bit weak. It will be powered by 1.2GHz MediaTek MT6589 quad-core Cortex-A7 processor which will get the support of PowerVR SGX544MP GPU and 1GB of RAM. So the user can definitely expect the good performance experience from the device. It is still unclear that which OS the device will run but we are suspecting it to latest Android Jelly Bean version 4.2 or probably 4.1.There’s no 4G in tnis device, which is fair enough, as you’re unlikely to want an expensive contract to go with a cheap phone and will get the power of 2,000mAh battery which is also pretty decent. The Acer Liquid E2 will be featuring an 8MP rear camera which will support Auto focus and the user can experience the video chat with 2 MP Front facing secondary camera. The device will be coming with 4 GB internal storage and will be provided with a microSD card slot with which the user can expanded the memory upto 32GB as per the user’s requirement. It will also support the basic connectivity like Wi-Fi, Bluetooth 3.0, GPS with A-GPS and FM radio. 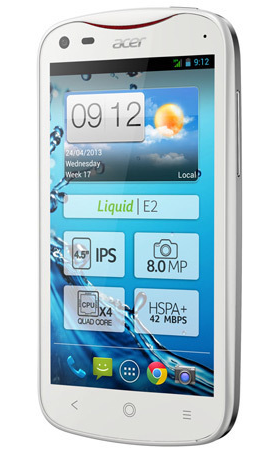 Display Size: 4.5-inch display with 960x540p resolution. The interesting thing about this phone is that it will operate on HSPA+ networks, fetching speeds of up to 42Mbps and provided with a promising zero shutter delay on the camera, which will bring users higher quality photos while trying to capture action scenes. Also from the other technical specs the device looks good and worth for thr price tag of €229. As per the company ,the Acer Liquid E2 will be available in Belgium, Netherlands, Ukraine, France, followed by Spain, UK, Italy, Germany and Russia starting from mid-May at a suggested price of €229. The Acer Liquid E2 will be available in two colours: Rock Black and Classic White.